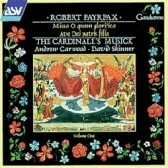 This is the first of five discs devoted to the complete works of one of England’s greatest composers, Robert Fayrfax. The recording made such an impact when it was released in 1995 that it came away from that year’s Gramophone Awards having won the Early Music Category. The Missa O quam glorifica is one of the most complex masses of the period. Probably written as part of Fayrfax’s submission to the University of Cambridge, it is a piece designed to show exactly how superb a composer he was. Also included is the setting of the popular text Ave Dei patris filia and three secular songs designed for use in the court.